Belated Donut Celebrations and Back to the Long Runs! Happy Monday! Ready to start a great week? I am so excited to get through Monday-Thursday because from Friday- Sunday, I am going up to San Francisco! I am going up for a work event and Anthony is coming. When I’m not working, I’ll be visiting all of my friends that moved to San Francisco after graduation. Favorite city with my favorite friends- it’s going to be a good time!! The lines for all donut shops on National Donut Day were crazy!!! I postponed the celebration until Saturday morning. After an hour and twenty minutes on the trainer, this coconut chocolate donut sure hit the spot. The rest of Saturday consisted a lot of relaxing, time on the couch, and with my good friend, Netflix. Bo Burnham just came out with a new comedy piece that Anthony and I found hilarious. Near tears at some of his jokes!! This Snapchat was pretty accurate with a cute snoozing pup next to us:) Sunday ended up being a lot more of a productive day, starting with an early puppy training class, then acai bowls in Pacific Beach. Does anyone else have problems with their name being spelled correctly? Happens to me all the time no matter where I go. Post acai bowls was time to go up to Encinitas for a new bike helmet at my favorite bike shop, Nytro Multisport, and then a visit to the best dog park I’ve ever been to. Anyone in San Diego with a pooch, I highly recommend the Encinitas Community Park. It is family and kids friendly with baseball and football fields, play areas, and a skate park! Does anyone know how we can get a puppy to look at the camera? Since we don’t end up in Encinitas very often, we wanted to take advantage of local hot spots and of course, had to cross of a brewery on our list, the Lost Abbey. And finished off the day with 7 treadmill miles. Great way to end the day and I’m so happy to be incorporating long distance running back into my schedule 5 weeks after surgery. I was feeling pretty bummed when I woke up this morning because it was the first time in 4 years I wasn’t doing some version of the Rock n Roll 1/2 Marathon or Full Marathon. Excited to get back out there soon stronger than ever. Had to sit on the ground for awhile after that one. Thank goodness for a cold bottle of water and Miss USA playing at the gym to keep me entertained during my stretch and cool down period. Good morning everyone! Hows your Tuesday going so far? My past two mornings have been a little tough getting out of bed post-Ragnar and my brain has felt like mush up until today, so I can finally type out a recap! 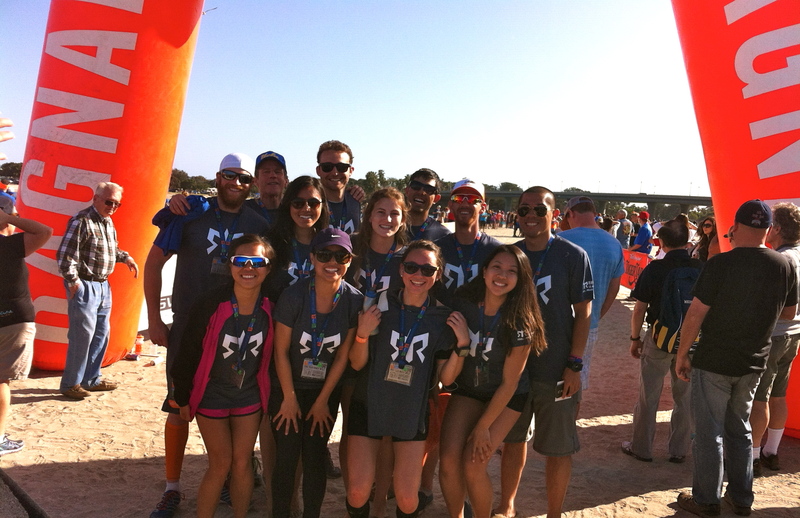 Let me just start off by saying, Ragnar was the most incredible experience. The teamwork, the friendships, the laughter, the running, the sleep deprivation… 100% worth it for this experience. 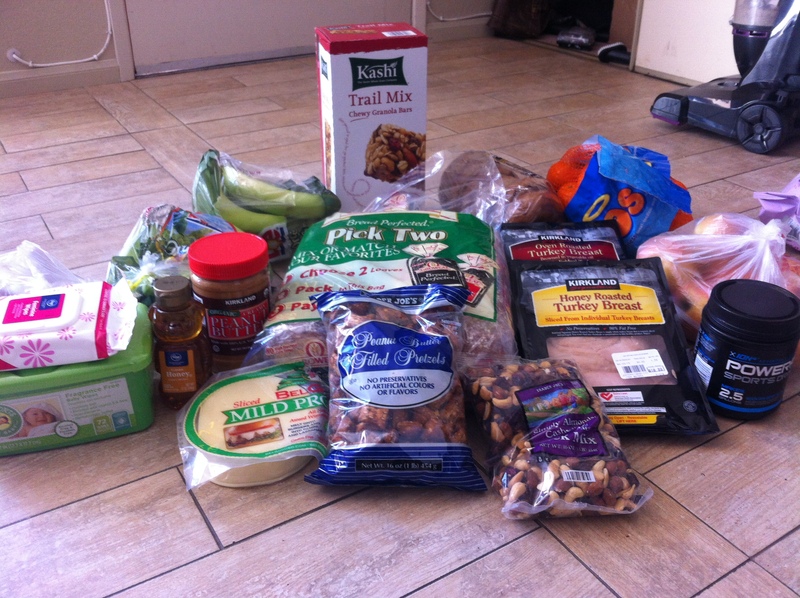 We made sure we packed a lot of food and baby wipes to last us through the next few hours! 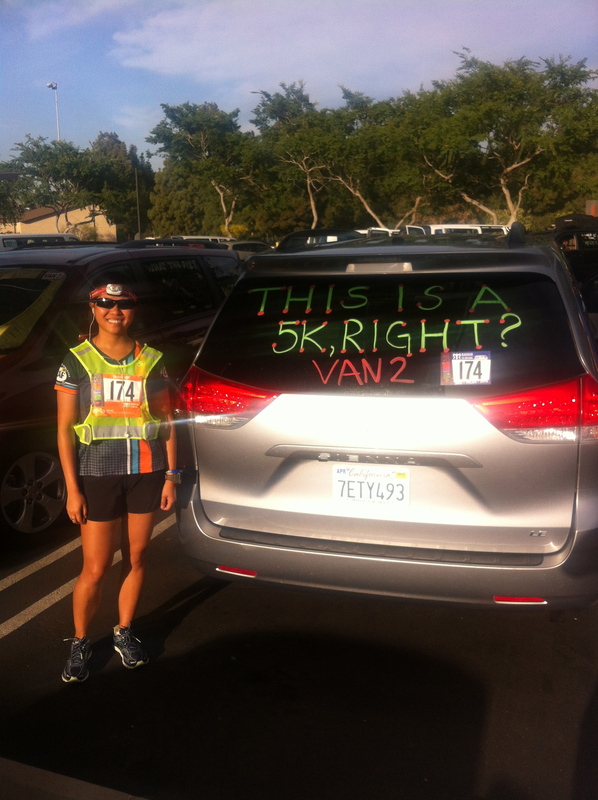 I was in van 2, so we couldn’t start running until van 1 one finished their first legs. 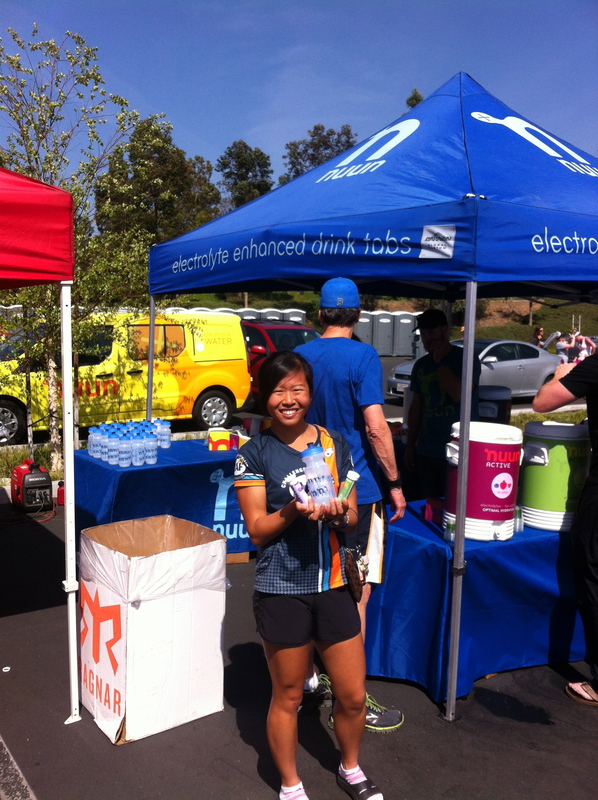 We got to start a little bit later (sorry van 1 for having to wake up at 5) and drove to exchange 6 to hang out, stretch, check out the expo they had, and stock up on Nuun! Here comes Janice, meaning it was our turn to start! And van 2 has started! Brandon was leg 7 and I was leg 8, so I spent the entire time during his 12 miler feeling extremely impatient to start running. I wasn’t scheduled to run until 5:50PM and as a morning runner, I experienced a lot of angst waiting for my turn. The last few minutes before Brandon was scheduled to come in so I could take off! 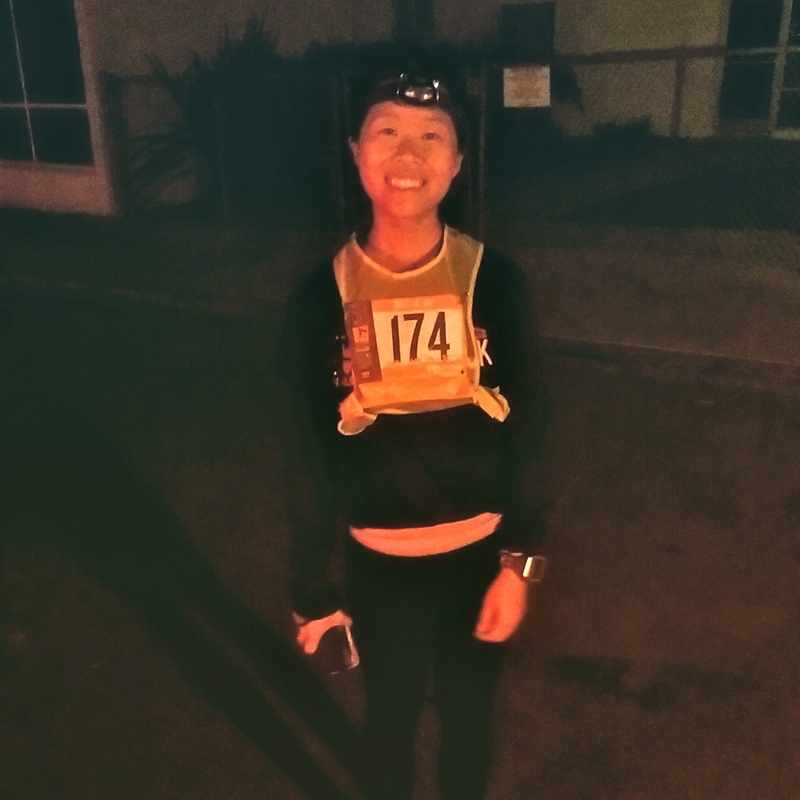 For Ragnar, any time from 6:30PM-6:30AM is considered night time and you have to be wearing reflective gear- even though I started my leg around 5:50PM, it was going to be considered “night time” once I started going. My first leg was 9.3 at 7:55 min/ mile! 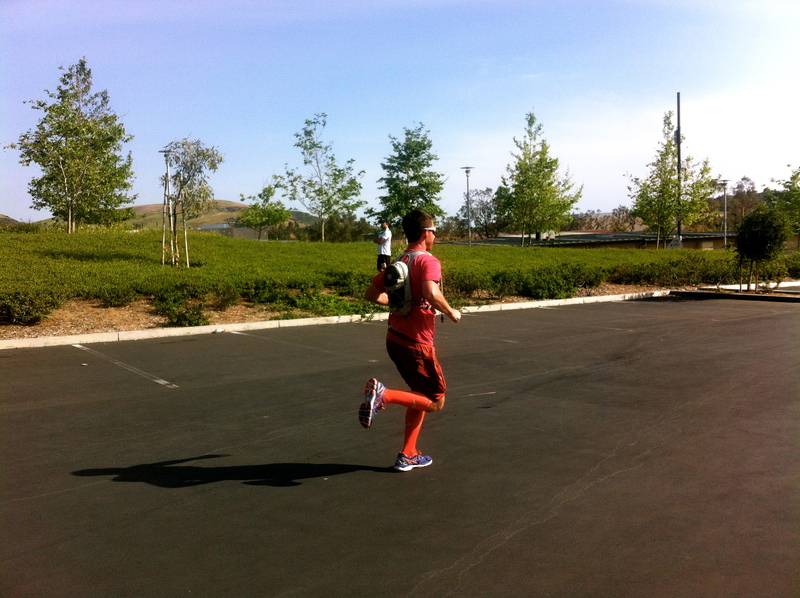 My coach and I discussed Ragnar strategy of having two tempo runs and 1 marathon goal pace run during Ragnar. I didn’t believe I could do it and kind of regretted how fast I ran the first leg!! This one was a little tougher- 5.4 miles in the dark at 2:30AM! I was definitely feeling a little anxious about running this leg, especially since the longer your leg is, the less people in between you there are. However, something about the fear and adrenaline caused this leg to be ran at a 7:56 min/mile average, knocking my two tempo runs out of the way! 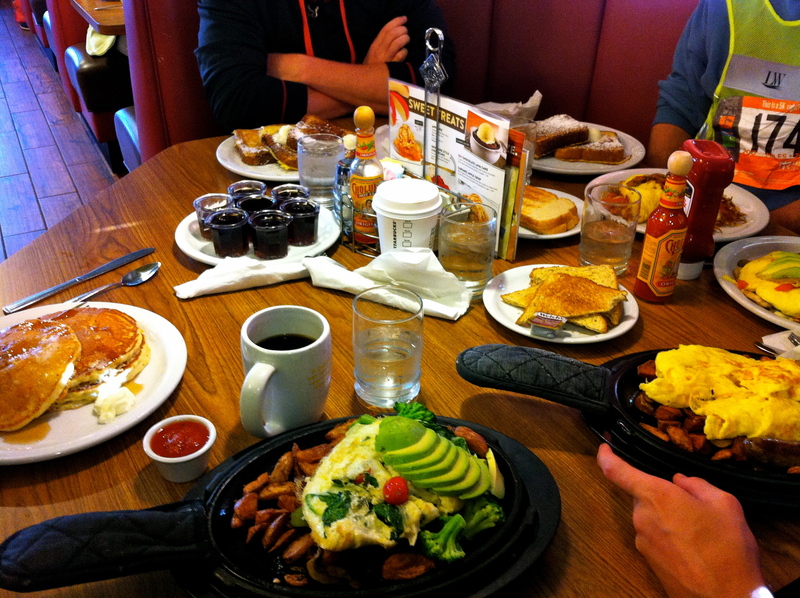 The next morning after our van finished by 6AM, we found the nearest Denny’s we could for real food. Even diner food tasted good after nothing but peanut butter, bread, pretzels, and bananas. It didn’t necessarily feel good a few hours later, but no regrets in the moment. 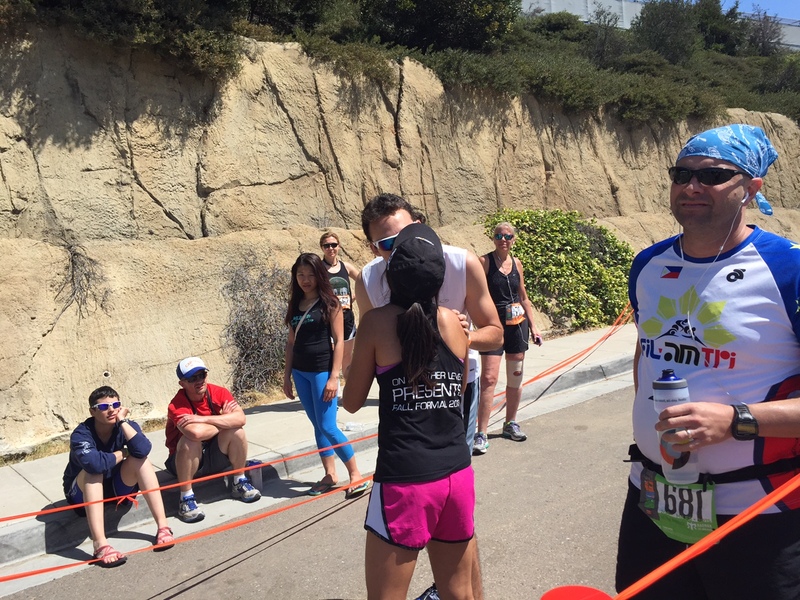 My last leg was the toughest- 8.8 miles through La Jolla. I was definitely familiar with my surrounds and where I was running since I’ve ran a lot in these areas but I didn’t know if my legs could handle such heavy elevation. Finished in 9:19 min/mile, 19 seconds slower than my marathon goal pace! 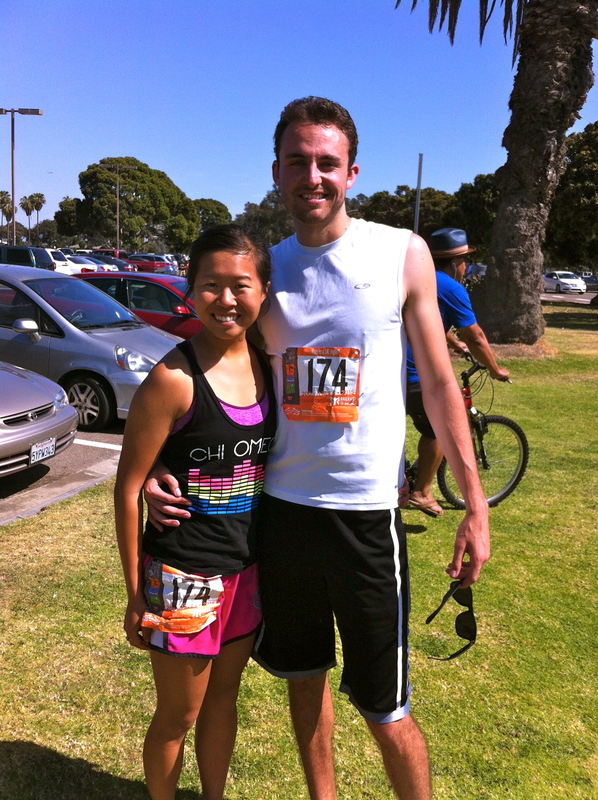 I’ll attribute that to all the hills ;) Anthony and I both finished our legs! 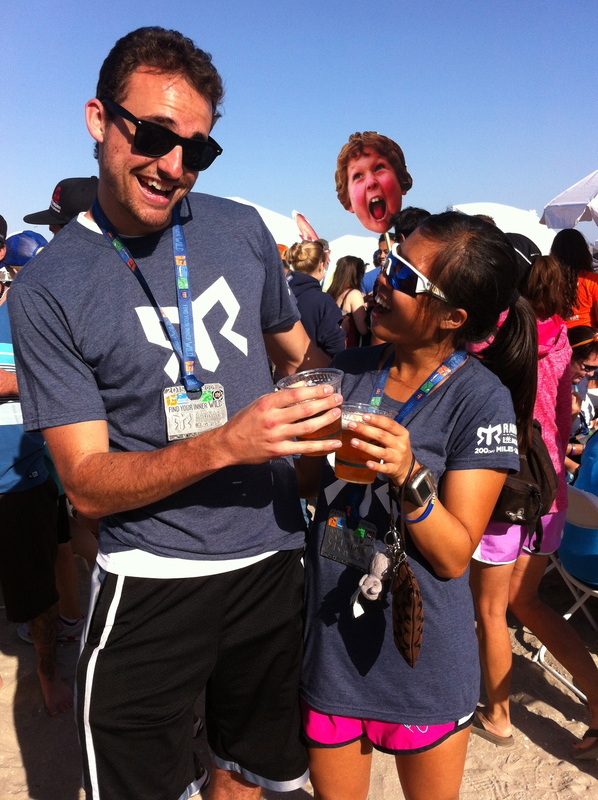 Time for 3 more teammates to finish theirs before we have finished our FIRST RAGNAR! Rachel was our last leg so we were so excited to run to the finish line with her. She absolutely killed it, sprinting the 100 meters, making it very hard for us to follow! 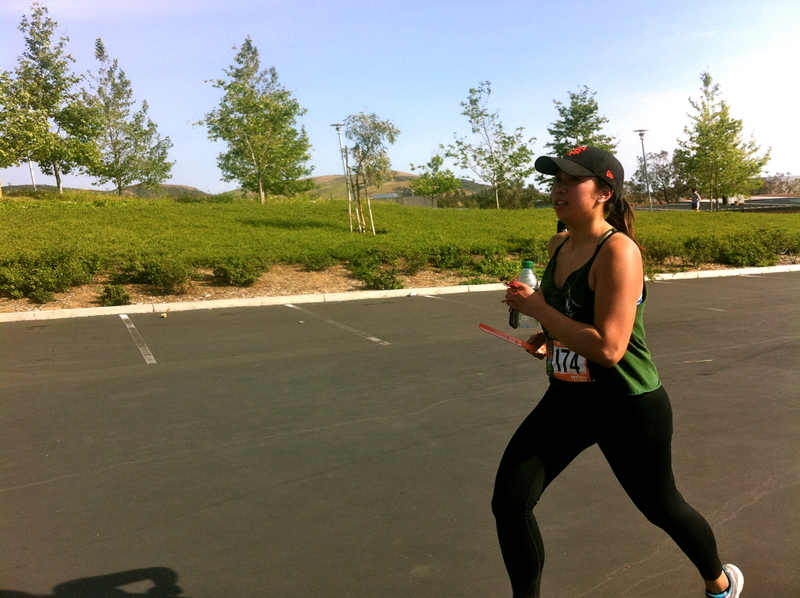 29 hours, 22 mins, something seconds later, and our SoCal Ragnar Relay was done! We probably got a total of 2 hours sleep during that entire trip, but it was well-worth it. I am hooked and ready to relay again! 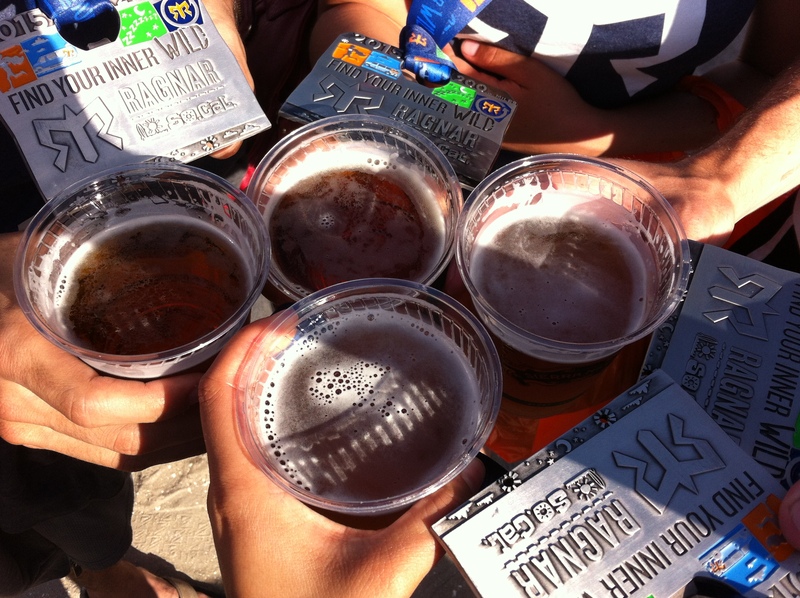 Medals and beer- the perfect combo. Cheers to the perfect and best 2 days of my life! Oh yeah, my legs were in serious need of some TLC after. These elevation legs were great and served as massaging compression socks. I was a little skeptical at first but once they started, I was in heaven.